If the Greek god Poseidon himself were to ride a personal watercraft, the 2011 Sea-Doo GTX Limited iS 260 would be his chariot. It is a luxury watercraft in every sense of the word, boasting a list of features sure to make it the envy of every other PWC on the market today. The iS stands for Intelligent Suspension, and it definitely lives up to its name. Offering a full six inches of travel, Sea-Doo achieves an unparalleled smooth ride by essentially dividing the hull of the craft into two halves. The upper half is comprised of the seat, footwells, and handlebars, while the lower half simply consists of the hull. By connecting the two halves of this machine together via a twin-arm suspension, that utilizes a shock absorber and spring system, the rider can maintain speeds and performance on the water in conditions that would be absolutely punishing on a craft that doesn’t feature such an incredibly innovative suspension system. In case you weren’t completely convinced as to just how “intelligent” Sea-Doo’s suspension system really is, when passengers are along for the ride, an onboard computer steps up and perfectly calibrates the amount of shock absorption that is required. However, for those of you who are more the hands on type or are a little reluctant to fully submit to a know-it-all computer, the system also features a manual override setting that allows you to stiffen or soften the ride according to your preference and riding style. Still not sold on the virtues of this impressive watercraft? Alright, then how about both an Intelligent Brake and Reverse (iBR) and Intelligent Throttle Control (iTC) system? Toss in both of those and you begin to realize that this watercraft really does come fully loaded with some fantastic features. 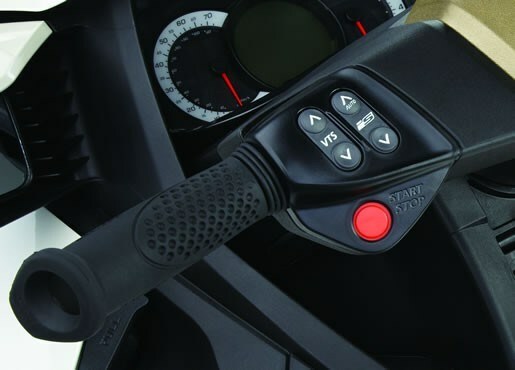 The brake and reverse are easily engaged and controlled by a lever on the handle bar, opposite the throttle control, making them both very intuitive to use. The braking system is extremely effective whether employed at high or low speeds and significantly decreases your stopping distance. The iBR system really shines when launching or docking. The GTX Limited starts in what can best be described as “neutral” and by using the brake/reverse lever in conjunction with the throttle, the rider has precise control and can easily maneuver the craft into virtually any position. With iTC you get features like cruise control as well as No-Wake, Touring, and Sport modes, which are all pre-programmed settings that allow you to customize the performance of this luxurious ride. In total the digital driving center features 34 separate functions. The GTX Limited iS 260 is certainly no slouch in the power department either. It features Sea-doo’s rock solid Rotax 4-TEC 1,494cc engine, which produces 260hp by way of both an intercooler and a supercharger. Its top speed is limited to 104-107 km/h (65-67 mph), and is best achieved by running the craft in the Sport mode. With all of this power at your disposal, Sea-Doo very wisely designed a color-coded lanyard system that allows you to restrict the amount of power in the event that an inexperienced rider is operating the watercraft. 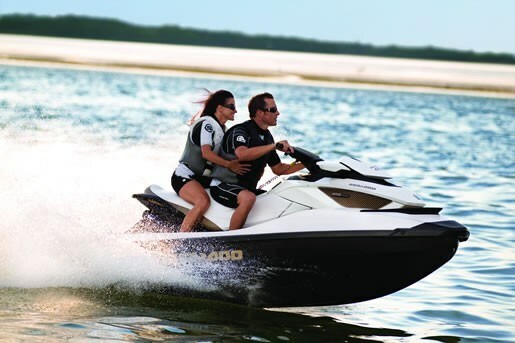 The list of extra features on this personal watercraft is extensive and includes: adjustable handlebars, retractable mooring lines, glovebox organizer, depth finder, dry bag storage, custom cover, safety kit and much more. The list really does go on and on, but the best way to find out everything that this incredible watercraft offers is to simply hop onboard and experience it’s luxury and performance for yourself. Available in Pearl White, which seems very fitting since this is one personal watercraft that truly is a treasure to behold.